While Texas may be home to the Longhorn and debatably the best BBQ, the great state is also known for one thing in particular, its growing real estate options. From starter homes to premium living, Texas offers the best real estate options for every living situation that are too promising to pass up. The best part? Texas's land size per home is pretty unbeatable. As a buyer, land size should be important. In fact, 43 percent of Americans want a larger home and see upsizing in their near future, making Texas’ wide open spaces pretty appealing. So, how can this one state have everything a homebuyer dreams about? Trulia’s recent report, “Room to Roam,” dissects each home buying segment to determine the cities with the best real estate options, in terms of space. Let’s take a deeper look at the three main home ownership phases to determine if Texas real estate options trump the rest. Finally ready to invest on your first home? A starter home is generally a smaller, economical house targeted at younger couples or families in the midst of buying their first home. This could be the biggest investment they have considered to-date, making this decision possibly stressful and time-consuming. However, it is safe to say that buying a starter home in Austin could be your best bet. 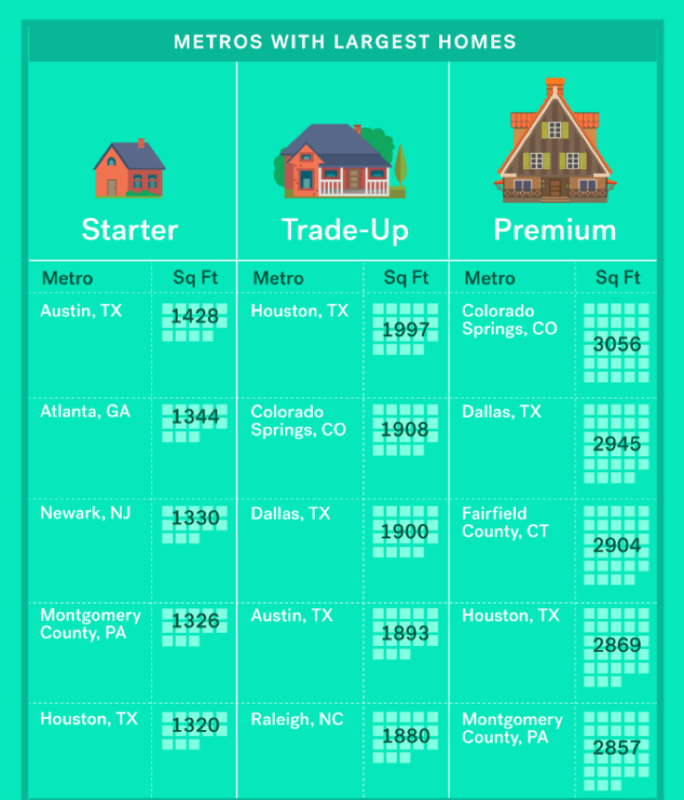 According to Trulia, Austin ranks No. 1 metro in the country with the largest starter homes - an average of 1,429 square feet. Putting that into perspective, a starter home in San Francisco is 1,080 square feet and only 945 feet in Detroit. A starter home in Houston averages 1,320 square feet, making it another metropolitan area with the largest median home size. Another perk to buying a home in Houston? There is a 51.3 percent space gain between starter and trade up homes, which is essential to think about moving forward. The next step on the housing ladder are trade-up homes. Why do most buyers decide to make this transition? The answer for most is size and space. Conveniently, not only will a home buyer in Houston see a 51.3 percent space gain, but the median square foot per trade-up home is estimated to be 1,997 square feet, making Houston the top metro with the largest trade up home space in the country. Dallas is another city to keep your eye on as a home buyer. Close behind to Houston, Dallas trade up homes average 1,900 square feet, with a 49.7 percent space gain between starter and trade up homes. Large-scaled homes, with massive porches and fenced-in backyards flood the minds of all Americans. A premium home is the end goal for all buyers, and if you have finally reached this point, you may want to look at first at Dallas real estate. Aside from the percentage gain a buyer sees when upgrading from a trade up home, premium homes in Dallas average 2,945 square feet, making it the second metro with the largest sized homes, behind Colorado Springs. Word of advice, don’t wait to start climbing the housing ladder in Texas. Austin offers the largest starter homes in the country, and homeowners residing in Austin see a huge land gain when transitioning to a trade-up home. Dallas, another promising Texas metro, trumps a vast amount of other cities across the country when it comes to overall space as well as percentage of space gained during the transitioning stages. It is also the second largest metro in terms of premium home size. Texas real estate options will give you all the space you have dreamt about all while enjoying Texan exclusivities like sweet tea and kolaches. Who’s ready to move y’all?